Located on the world famous Avenue of the Giants in the quaint historical town of Redcrest is the family owned and operated Redcrest Resort. The Avenue of the Giants is a 32-mile scenic drive that winds its way through the giant redwood trees of Humboldt Redwoods State Park. In a recent survey conducted by the Humboldt County Convention and Visitors Bureau, of the top 10 attractions on the Redwood Coast, the Avenue of the Giants was voted #2. Before the automobile, the stage coach route from San Francisco to Eureka passed through the property that is now the Redcrest Resort. Now the Avenue of the Giants is a quiet, scenic alternative to Highway 101. 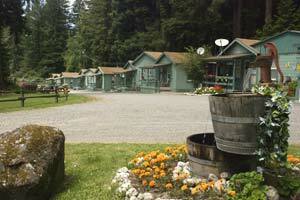 You will find the resort a scenic 4 hour drive from the Golden Gate Bridge or a pleasant 35 minute drive from Eureka. You may choose to stay in one of our 10 quiet, cozy cabins or our 2 bedroom vacation home. Park your R.V. in one of our full-hookup spaces, or pitch your tent. During your stay you can enjoy our amenities such as our large playground, outdoor hot tub, gift shop and group fire ring. Your pets are always welcome. Come spend a night, a week, or two. Sit on your porch and enjoy the blue sky, the clean air, and the tall trees at the beautiful Redcrest Resort. Northern California's "Redwood Coast" is the No. 1 spot to visit! Lonely Planet, which is among the world's largest travel guide publishers worldwide, put together a list of the top 10 underrated, rejuvenated and out-if-this-world-spots to visit this year. According to editors and researchers of Lonely Planet and the Los Angeles Times who visited these spots, Northern California's Redwoods ranked as the number one place to visit. © Copyright 2004-2019 - Redcrest Resort - All rights reserved.